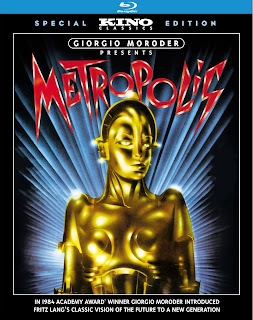 Blu-ray Review | "Giorgio Moroder Presents Metropolis"
For fans of Fritz Lang's science fiction masterpiece, Metropolis, Giorgio Moroder's 1984 modern retooling will either be something of a strange curiosity, or a monstrous sacrilege. As something of a purist myself, I would normally be more inclined to go with the latter, but as patently ridiculous as the final result of it is, it's far too goofy and campy to be of any real offense. It's more of a sideshow act that any real affront to the film's legacy, a strange relic of the 1980s that may be of interest to cinephiles and those who have a nostalgic connection to it, but otherwise this oddity feels like an object out of time. 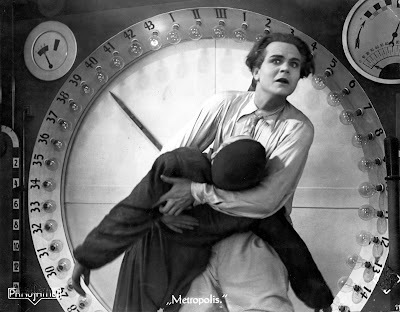 Credited as having introduced silent film to the MTV generation, Giorgio Moroder Presents Metropolis dared to take the groundbreaking 1927 epic and replace its grand score by Gottfried Huppertz with modern (for the time) rock songs. Featuring new music by Moroder himself, performed by artists such as Freddie Mercury, Pat Benatar, and Bonny Tyler, Morodor's version of Metropolis set out to make the film accessible to a younger audiences who previously had no interest in silent film. The problem is, of course, that Metropolis was already probably the most easily accessible to modern audiences of all silent films. 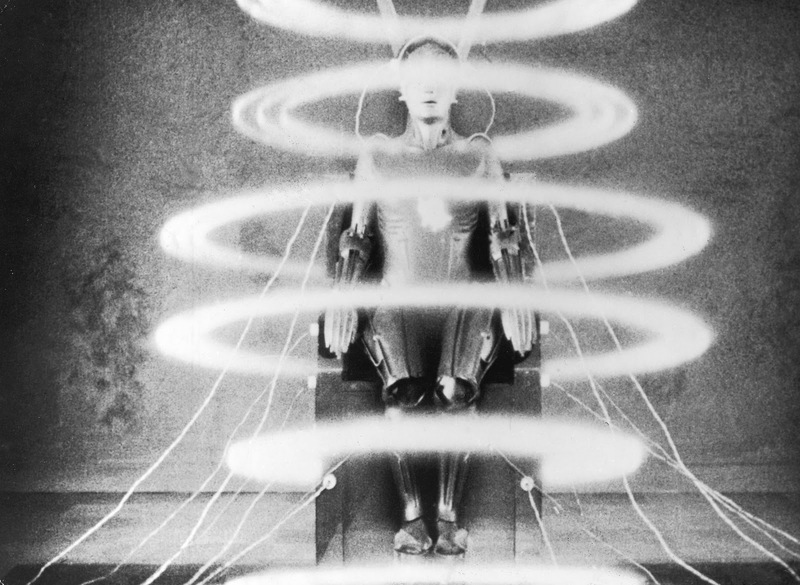 A grand science fiction epic and clear precurser to films such as Blade Runner (whose production design owes a great debt to Metropolis' towering cityscapes), Metropolis is disarmingly modern, with special effects that are still pretty impressive today, let alone 84 years ago. Set in the dystopian future, the film tells the story of a society divided into the wealthy ruling class who lives above ground, and the poor laborers who live below ground, slaves to a never-ending cycle of monotonous work on a constant 10 hour cycle. But a young woman named Maria seeks to end this class division and bring the workers up into the daylight. A peaceful messiah, she preaches that "there can be no understanding between the hand and the brain unless the heart acts as mediator." One day, while leading a group of poor children into one of the city's lavish pleasure gardens, Maria meets the son of the city's ruler, a kind of CEO in chief. He becomes fascinated by her, and follows her into the depths of the city, and is so moved by the workers' plight he decided to join them and fight for their freedom. But two other men are deeply infatuated with her as well, one a mad scientist who has created a robot in her image, one that will be sent by its comissioner, the ruler of Metropolis, to create a violent rebellion that will put down the masses for good. It's all very intense and remains surprisingly timely in its depiction of income inequality (a theme we see played out on the news every day), but when companied with the cheesy 80s rock songs, its hard to take seriously. 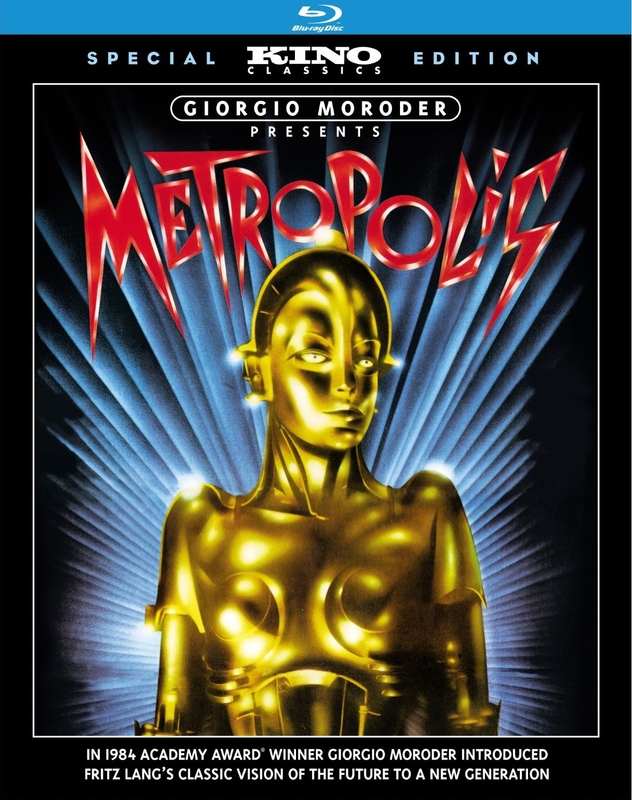 Moroder's version is notable for having incorporated newly discovered footage for the time that had never been seen before, but in light of Kino's excellent re-release of the complete cut of Metropolis, which is over an hour longer than this cut, it really renders this version, while notable for its time, moot. Without that extra hour of footage, the plot feels truncated and rushed, and lacking in the nuances that the complete cut has. Not to mention the fact that the music makes it feel more dated than the fact that it's a silent film. You can't fault Kino's presentation, which is typcailly excellent, but the film is more of a novelty than anything else. While Metropolis itself remains a masterpiece, Moroder's version is little more than an artifact, a curiosity of another time that just doesn't quite translate the way it may once have. Metropolis is a timeless work, Moroder's Metropolis is fully trapped in 1984. That's probably the most damning aspect of this version. It improves nothing, adds nothing, and ultimately dates a once ageless film in a time that's not its own. Chalk this one up as another cinematic sideshow that's worth a look once, but little more than that.